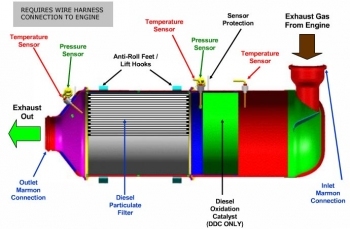 DPF-Cleaning: Diesel Particulate Filter | Utah Carbon Cleaning LLC. 1 - Why does my DPF get dirty? Soot particles are burned off steadily without the intervention of the ECU. This is achieved at standard highway speeds (3000 r/min). The temperature of the exhaust gas will reach around 660°F - 930°F. - A model based on the driver profile, which calculates saturation according to a specific pattern of signals coming from the temperature transmitters of the exhaust gas as well as the oxygen sensor. - A model based on the flow resistance of the DPF, which calculates saturation according to signals reassembled by the differential pressure sensor, temperature transmitters, and air flow meter, which then all inform the ECU of the degree of saturation inside the DPF. - Regulating the flow of air through the electronic throttle control (ETC). 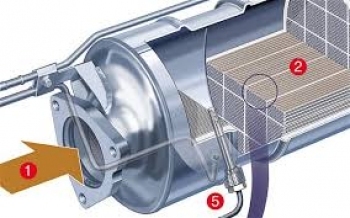 - Deactivating the EGR valve from recycling exhaust gases in order to increase the combustion temperature. - Triggering a first post-injection following the principal injection in order to increase the combustion temperature. - Triggering a second post-injection, causing the unburned fuel to evaporate inside the combustion chamber. The unburned hydrocarbons are oxidized by the vapor inside the catalyst converter. The heat generated during this stage can reach temperatures of 1140°F inside the DPF. - The transmitter signal, located upstream of the DPF, is used by the ECU to determine the amount of fuel to be injected in the second post-injection.